Falaise Park is named for a historic end-of-war battle centred around a small French village where tens of thousands of soldiers lost their lives. After WWII this forested hill in East Vancouver was cleared and transformed into the Renfrew Heights Housing Project for War Veterans, built to accommodate returning soldiers and their young families (those without families were less fortunate). Post-Traumatic Stress Disorder—known then as Battle Fatigue and formerly Shell Shock—was one of the inevitable and brutal effects of this war, causing these soldiers and their families tremendous suffering that continues to reverberate to this day. 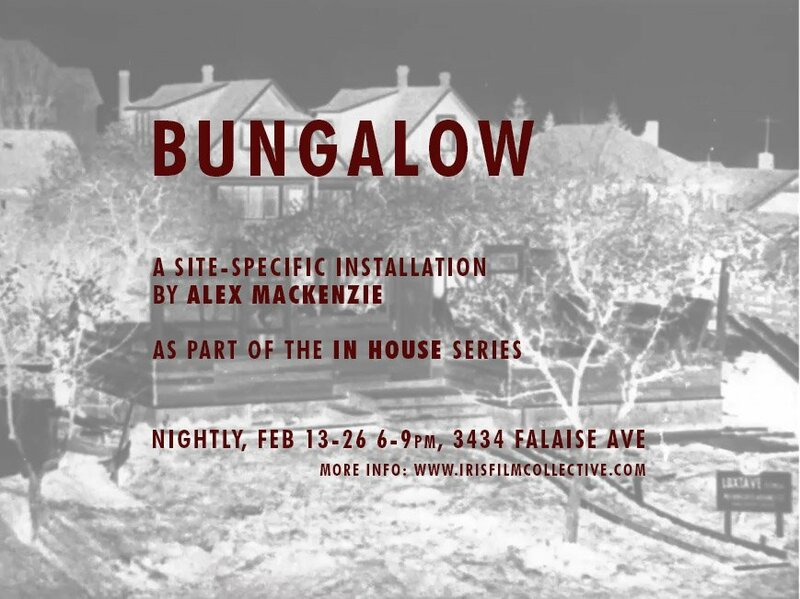 In MacKenzie’s BUNGALOW, the audio from various Allied forces propaganda films from August 1944 (Pathe, Movietone, etc.) describe the inhumane death tolls at Falaise in France. This audio is converted into light using strobes that are triggered based on volume and rhythm. Seen from outside, the house is transformed into a pulsing emblem of the cost of war. Upon approaching the building one can hear the muffled audio contained by the walls of this symbolic home on the hill.